Our Active Committee consists of 10 pupils, from 2nd class upwards. The active School Committee has many responsible roles such as organising the playground leaders, making announcements over the Intercom, visiting the classrooms to talk to the classes about our different activities, keeping the Active school noticeboard up to date, keeping the PE storeroom in check, conducting and recording surveys. Our Active School Committee members are easily recognisable with their committee badges. As well as a very enthusiastic and dedicated Active School Committee we also have a team of PE monitors in place from every class in the school. The PE monitors keep the PE store room tidy after PE lessons! Notes from our local GAA clubs are often sent out via the school and local sports coaches visit the school regularly. Castlerahann GAA club have a noticeboard in our school which contains lots of information about local events. Many of the local Castlerahan Coaches are parents of our students and we have strong tradition of GAA within the school. Pictured is Lizzie Brady with her daughters Coleen and Stephanie. Lizzie is a member of our Parents Association and is very much involved in all school activities but especially our Physical Education programme. Lizzie is a great supporter of all our active events in school but is also involved in local and county athletics and running clubs, of which many of our pupils and past pupils are members. Some of our fantastic parents joined in our Halloween Zombie Walk! Below are a list of local clubs, organisations and businesses that have come on board with St. Clare’s in our effort towards renewing our Active School Flag. Noeleen from Tree Frog Yoga Belturbet has very kindly offered to give 3rd class a taster Session of Yoga during Active Week 2019!! 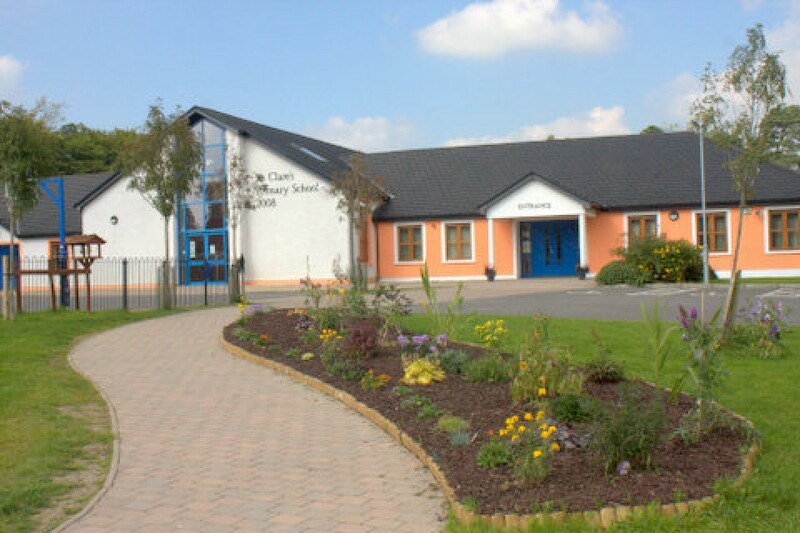 Instructors, Betti and Viktor, are working with Junior Infants, Senior Infants and 3rd Class during school hours and run an after School Club every Tuesday evening. Local Club ‘The Cavan Archers’ have kindly agreed to give a workshop during Active school flag week 2018. Due to the huge success of the ‘Tug of War’ workshop in our last Active school Week in 2017, we invited Ballinagh Tug of War club back again for 2018!! It was so popular with the children we included it in our Sports Day in June. The Tug of War rope is widely used in PE lessons across all senior class levels. Stephen is a local owner of a bouncy Castle and DJ business and has kindly agreed to work with us during Active School Flag week 2018. Michael the Tennis Coach visits our school annually and the children love their tennis lessons with him. Aine O’Reilly from Cavan Sports partnership is organising a Tug of War Blitz on December the 14th in Stradone Community Centre. 5 teams from 3rd and 4th class will attend the blitz! Let’s hope we bring home the gold! Update!! WE WON!!!! And we even made it into the local paper!! Students from 3rd and 6th class took part in Hurling Coaching provided by Cavan County Board for 5 weeks in September 2017. The Sports Shop Cavan very kindly and generously donated a prize for our ‘Women in Sport’ Competition. The Black Dragons are a local Kickboxing club based in Cavan. They have worked with us in recent years giving training sessions to our students in Kickboxing. These sessions have been very popular with our students and many are now members of the club. East Cavan Eagles Basketball Club based in Virginia College offers basketball for boys & girls from 7 years of age in their academy and competitive basketball in the NEBB Leagues for boys & girls from Under 12 to Under 18. Many of our students are members and 6th class recently took part in a basketball tournament before Christmas. We have a beautiful walk-way in the local area called ‘The Nun’s Walk’, which the school uses frequently throughout the year. It’s great for nature walks, seasonal walks, or just to enjoy a nice walk in the Summer term. The walk-way is featured on the ‘This is Cavan’ website and is graded as ‘easy’. It starts at the county Museum and loops around passed the school, through a wooded area and back down to the Museum. The children’s playground is located in the county Museum’s gardens. Children often get rewarded for their achievements and good behaviour with an afternoon trip to the playground. It’s a great way to make use of local amenities while getting plenty of exercise and having fun at the same time!